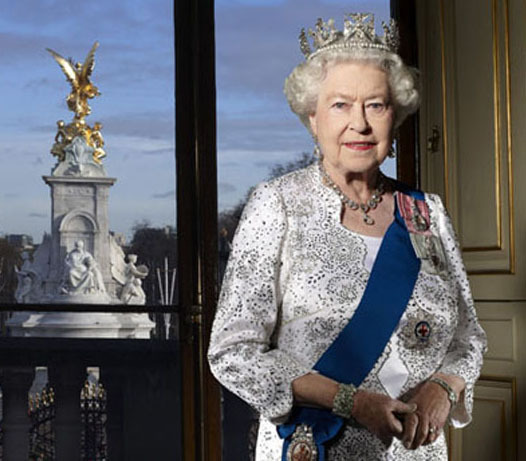 As you may be aware--if you've been keeping up on all things royal-- The Diamond Jubilee is taking place this year--right now as we speak in fact, marking 60 years of Her Majesty Queen Elizabeth II's reign. 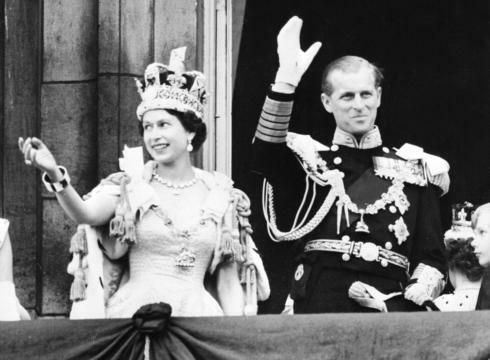 The Queen came to the throne on 6th February 1952 and her Coronation took place on June 2, 1953, so naturally this weekend is the Central Weekend of The Diamond Jubilee. Lots of events, parties and fabulous horse races have been taking place with a highlight being tomorrow's Thames Diamond Jubilee Pageant which will celebrate her 60 year reign with a flotilla of 1,000 boats on the River Thames which will be televised live on various networks such as CNN and BBC of course. 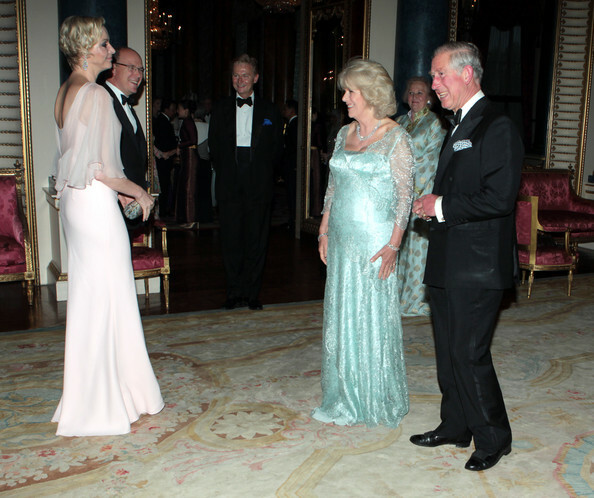 Monaco Meet England: Prince Albert and Princess Charlene of Monaco say "hello" to the Dinner's Hosts, Prince Charles and Camilla Duchess of Cornwall--The Duchess wore a duck's egg blue shimmery gown designed by one of her favorite designers (as well as the late Princess Diana) Bruce Oldfield. The dress featured a delicate lace with a deep v-neck and three-quarter sleeves; all over a matching satin inner gown. She looked like a very, very elegant Mother-of-the-Bride, and I mean that in a good way! I LOVE her! 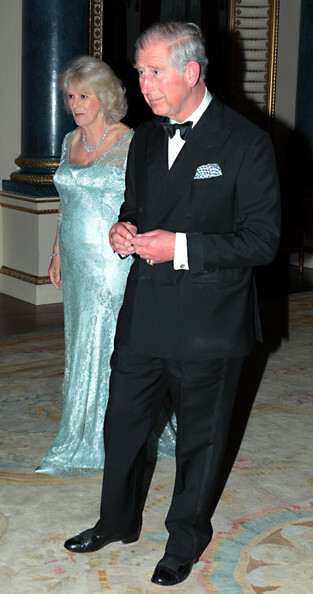 I also love Prince Charles black tie patent leather slippers. I want a pair! Peach Princess: Monaco's reigning royals, Prince Albert and his wife, Princess Charlene looked fresh and modern in their "Royal Red Carpet" looks. The statuesque Charlene wore a peach-colored silk crepe gown with a silk chiffon cowl-draped capelet from Christian Dior. The Princess always knows how to highlight those incredible swimmer's shoulders of hers and always chooses clean, elegant non-fussy styles, and it goes without saying, she always looks radiant in them. The blue-green colored gown is a hand-beaded silk chiffon dress featuring a satin waist-defining belt, three-quarter sleeves and flared shape with train. It's the SAME gown that Katy Perry wore to the 2012 Grammy Awards earlier this year. The difference is the Grand Duchess payed for hers (It's Haute Couture kids and probably cost a cool $100,000)...and there was another difference: when the Grand Duchess custom ordered this gown she had the neckline dropped and scooped. I think for her, this was a wise choice since it opened up her neckline and balanced her upper torso. Perfect gown Maria Teresa. Bellisima! King Carl XVI Gustaf and Queen Silvia of Sweden (top left): the Queen--who is of German and Brazilian descent--wore a silk taffeta navy blue high-necked ruffle Blouse/Jacket over an ivory gown skirt. On the right are Queen Anne Marie and King Constantine II of Greece. They don't really have a country to rule since the monarchy was abolished in Greece in 1973 but they still retain their titles. They're also VERY related to the British monarchs and just about all the other Euro Royals so they get invited to just about everything! 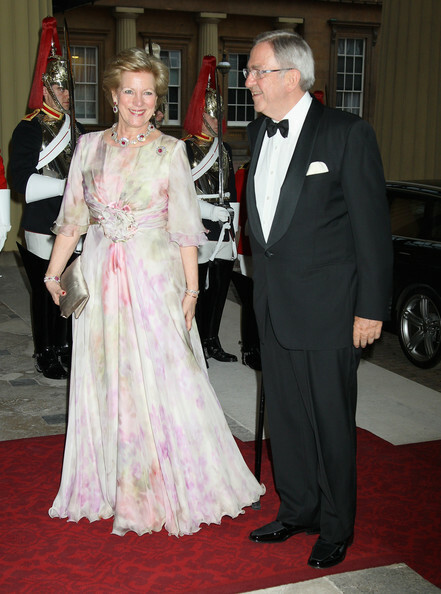 Queen Anne Marie of Greece (who's actually Danish) wore a very lady-like silk chiffon flower print gown with a rosette waist detail. I am not sure who the designer is but it's very Valentino. Old-school Valentino. 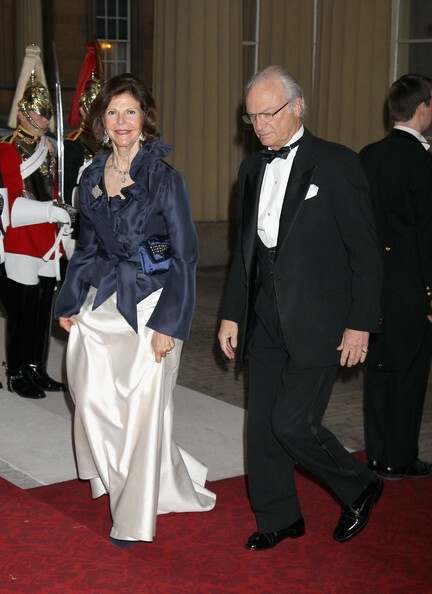 Queen Sonja of Norway (left) wore a deep red high necked gown with semi-mermaid skirt and a Royal-worthy matching wrap. This woman is exquisitely ROYAL from head to toe. No one in their right mind would confuse her for anything but being a QUEEN! Next to her is Queen Margrethe II of Denmark; I just LOVE her; she seems like a hoot--just look at that facial expression on her--complete opposite of Queen Sonja. Margarethe can't wait for her first cocktail at the dinner! 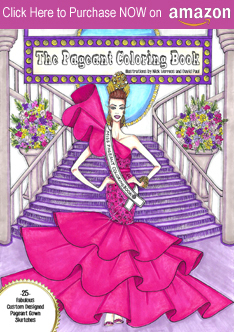 In terms of fashion, Queen Margarethe usually favors the big ol' ball gowns--usually with oversized flower prints. It was a nice change to see her in a more modern and not too over-the-top fashion statement. Rome, Italy born Princess Lalla Meryem of Morocco (left) is the first daughter and eldest child of the late King Hassan II of Morocco. 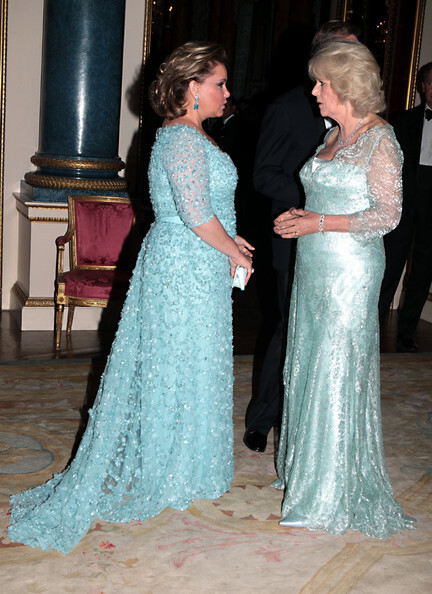 She's always very elegant and stood out with her Moroccan traditional gown at the Dinner Festivities. On the right photo is the always stylish Queen Rania of Jordan. A Royal Style Icon, Rania wore a color-blocked peplum gown with three-quarter sleeves, contrast waistband and "Mermaid-lite" shape. She is so ON TREND with everything in that gown, she's BEYOND Trend! 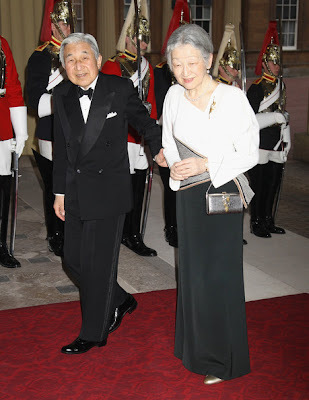 Emperor Akihito and Empress Michiko of Japan attended the dinner. The Empress look rather chic in a black and white column silk crepe gown with asymmetrical neckline and waist detail. But it is the Emperor who stands out for me: Simply, the Best Dressed Man of the Night! He looked impeccable in a double breasted tuxedo with peaked lapels. One of the wealthiest men in the World, the Sultan of Brunei Yang Di-Pertuan of Brunei Darusasalam attended with Pengiran Anak Saleha, wife and Queen Consort of the Sultan (left top photo). On the right is Princess Srirasm of Thailand, wife and Princess Consort to the Crown Prince of Thailand, who attended with her husband, the Crown Prince of Thailand, of course. I love how both of these ladies wore traditional ensembles and highlight the elegance and beauty of each culture. Take a look at this lovely lady above ---She is (wait for it!) 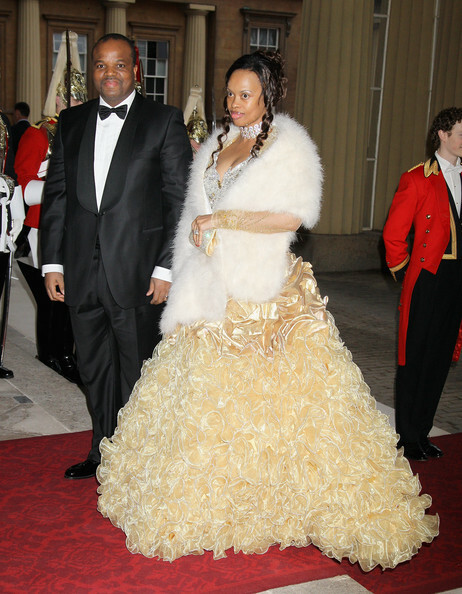 Inkhosikati LaMbikiza, one of the THIRTEEN WIVES of King Mswati III of Swaziland. First off, I just want to know how she got so lucky--out of the 12 other wives--to be the one to come to London. Does the King of Swaziland have a gold, diamond and ruby bowl that all of the wives put their names in and the first one picked was the Winner? Can you imagine! This above is what she wore to the Dinner for Foreign Sovereigns to Commemorate the Diamond Jubilee. 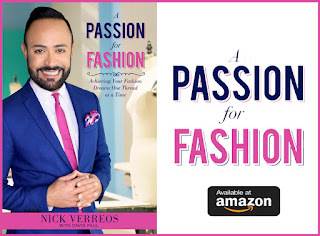 It was a gold iridescent confection of a gown featuring gold lamé and poly organza ruffles tiered into a frothy pouf-cake of a gown, the top section was beaded and then, if that wasn't enough, in case she would be cold, a white mink stole. Whatever it is, it's still TACKY-licious to me! One of my favorite pictures from the night's dinner is the one above where the Footguard is standing there, as she enters the Dinner Party, and you can tell that his insides are about to BURST out as he's trying to hold a professional look on his face while on the inside he is SCREAMING and saying "OOOOOH GURLLLL!!!" I'm just going to say it: I want to see more of Inkhosikati LaMbikiza! I really, really hope she will be attending the Thames River Diamond Jubilee festivities tomorrow, hopefully on her own boat--with TWENTY half-naked hot boys around her dancing! 0 Response to "ROYAL COUTURE.....Diamond Jubilee Dinner: Kings and Queens Red Carpet"